You can see the Green Mill marquee in the background. 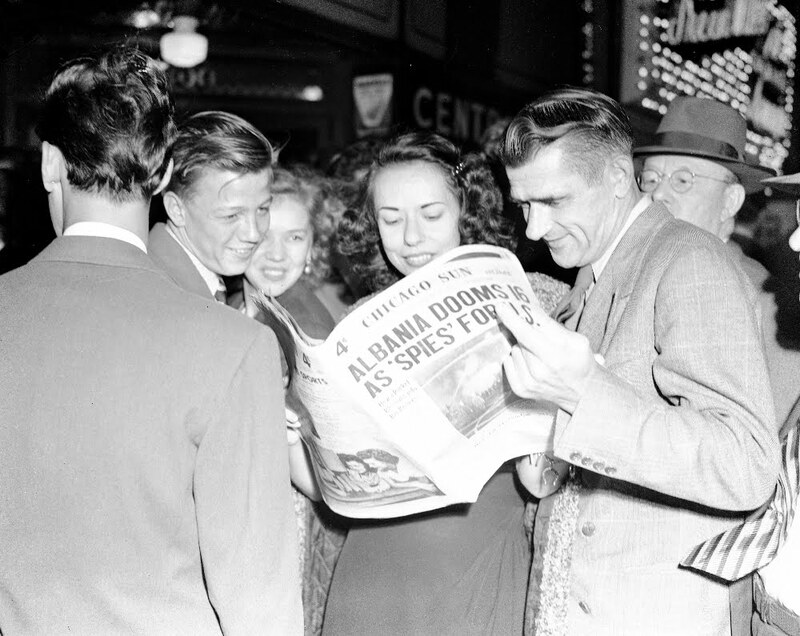 Original caption reads: New Sun paper being sold at Broadway and Lawrence. Judy Klein, Charles Hansen, Betty Manning, and Edward Schaefer are questioned by Jim Campbell from WBBM, Sept 29 1947. Original image available on ebay. Does anyone know if the Ed Schaefer in the photo is DR. Schaefer that had an office at Broadway and lawrence. In the day there was a news stand on almost every corner of a major intersection. I sold the Sun from a newsstand at Lawrence and Sheridan S.W. corner, they were made out of tin, and folded up compactly with a big padlock on the outside.comic books, Magazines,The Chicago Scratch sheet.both editions. the papers were about a nickel and the scratch sheet was a dime.